For those managing food allergies, eating out can be difficult or even downright scary. Many restaurants do not have standard protocols for dealing with them. 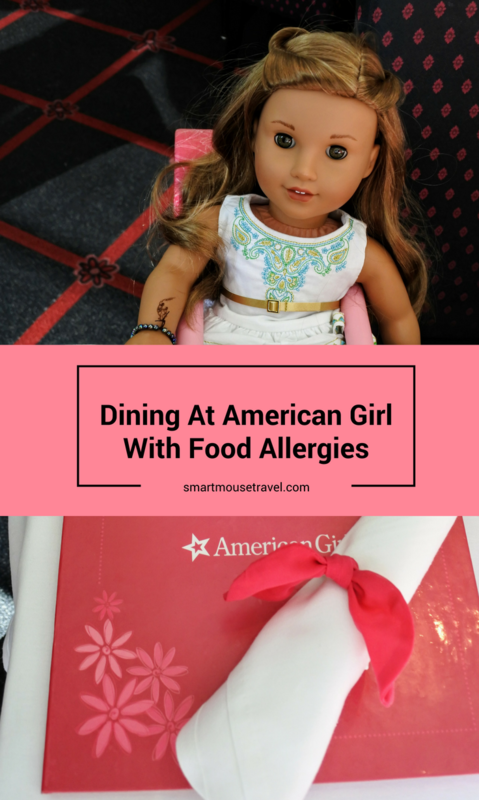 Imagine my joyful surprise when American Girl handled our food allergy wonderfully! The American Girl Cafe staff was consistently knowledgeable and competent when discussing our needs. We have had both a birthday dinner and a brunch with American Girl, and both experiences were fantastic. Why Dine At American Girl? 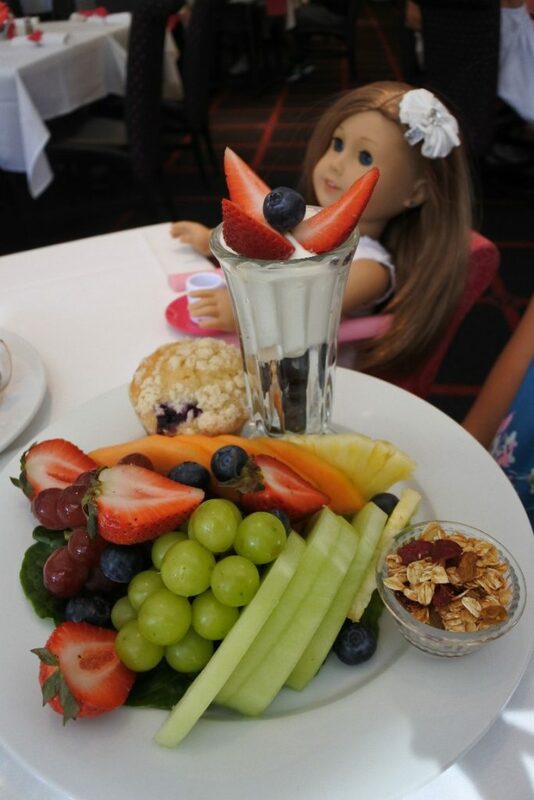 Dining at American Girl is an event for your child as well as the doll. 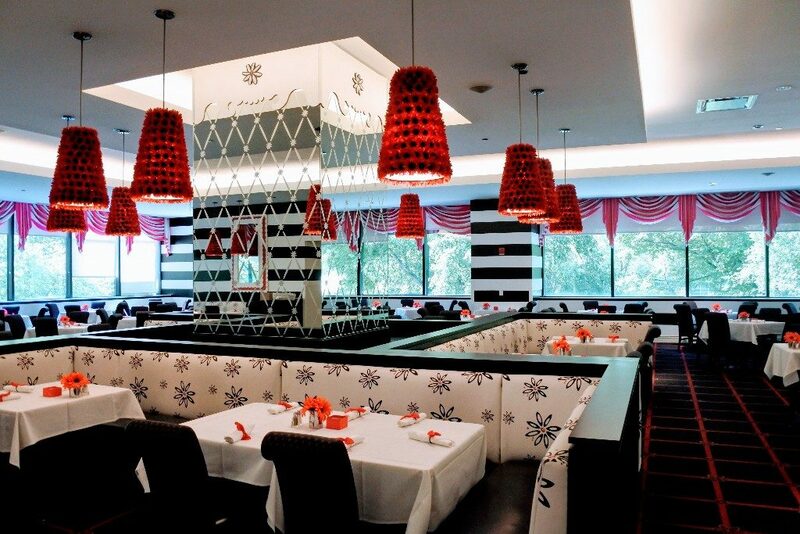 The beautifully appointed room at the Chicago cafe is decorated in black, white and hot pink. 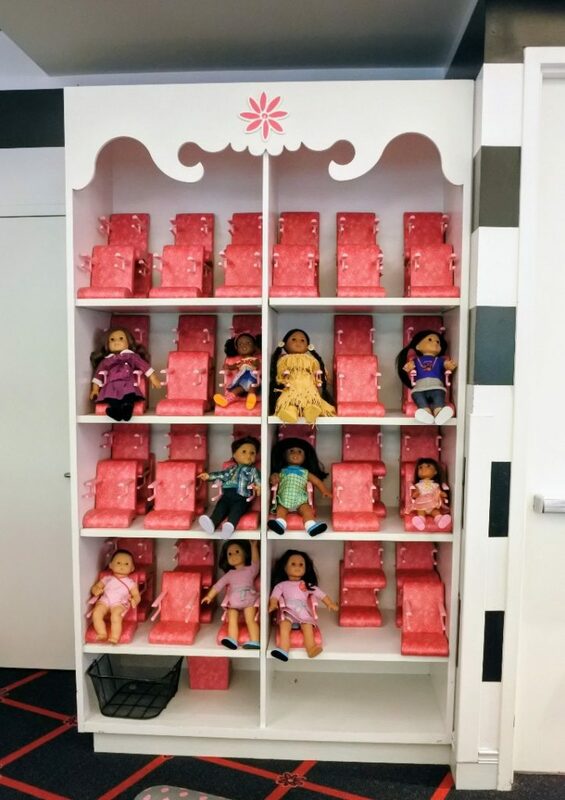 The dolls have their very own seat at the table at American Girl. Each doll is provided a mini mug and plate for the meal (and you get to bring the dishes home!). The cloth napkin holders are a hot pink bow hair tie which is a souvenir for you, too. Elizabeth and her friend loved having their dolls join in on the mealtime fun. Something I really love about dining at American Girl is the box of conversation starters at each table. We are a big fan of technology-free dining, so that helped us have some very entertaining discussions! Don’t have a doll? Don’t worry! The staff will be happy to let you borrow one for your meal. 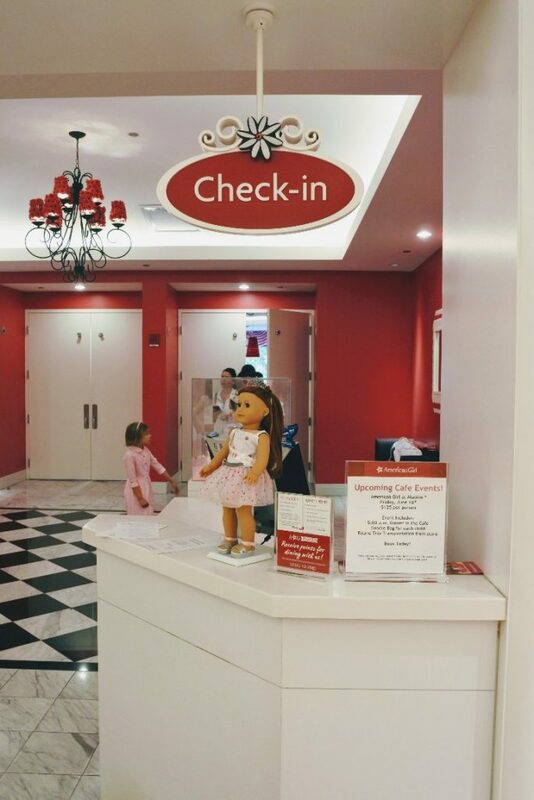 You have two options when making dining reservations at American Girl. You may make reservations by phone at (877) 247-5223 or online. When making reservations online or by phone you will be asked if there is anyone with a food allergy in your group. The allergy will be noted on your reservation. The day you arrive the note will be visible to all the staff at the Cafe/Bistro. This will prompt your server to discuss possible modifications to meal choices to accommodate the food allergy. If you make an online reservation the staff will be made aware of the allergies and can work with you the day of your visit to find options. I personally prefer making the reservations via phone. This way you can request that someone from American Girl contact you beforehand to discuss meal options. Please note that the caller ID may not show up as American Girl. The first call I received showed it was from “2755” with no name. Thankfully the reservation specialist warned me, or I might have ignored it. If you made a phone reservation and request to be contacted prior to your meal, a cafe staff member (either a chef or supervisor/manager) will call you regarding your reservation. I could tell the staff had researched available food options and possible modifications prior to contacting me both times. For both visits, we were able to discuss several meal options over the phone. One staff member even called an outside vendor to verify that the birthday cake would be safe for Elizabeth’s celebration dinner for our first dining experience. The cafe staff worked hard to find meal choices that were safe for Elizabeth. I have been very pleased when working with American Girl at how seriously they treated the allergy and how knowledgeable they were about how to find solutions for a meal. When you check in for your meal the staff will confirm there is a food allergy on file and make a note of it on your ticket. Once you are seated your server will come to the table as usual to greet you, but they will also reconfirm the food allergies and review entree options that work with the confirmed food allergies. Our most recent meal was brunch. I had the eggs benedict, Mr. Smart Mouse had cinnamon bun french toast with sausage, Elizabeth had the perfect pancakes with bacon (heart shaped – so cute! ), and her friend chose the fresh fruit plate. Elizabeth’s food was always brought out separately during our meals. Her entree even had a purple allergy flag on the plate to again show that those preparing the meal were aware of her food allergy. We all really enjoyed our breakfast! There was plenty of food for our meal. In fact, the girls each ate well and still brought home boxes of leftovers. As an added bonus, the coffee was nicely strong and refilled often. What a great way to start our day at American Girl Place! When Elizabeth had asked to celebrate her birthday at American Girl Cafe over the winter I was hesitant at first. Eating out has become stressful since her food allergy diagnosis. However, the staff, from the reservation specialist to the cafe staff via the phone to the server the day of our meal, were so well trained and knowledgeable we were able to really enjoy our meals. The only other place that we have had food allergies handled so competently is at Disney World (arguably the “gold standard”). This says a lot about the thought and training that goes into handling food allergies at American Girl. 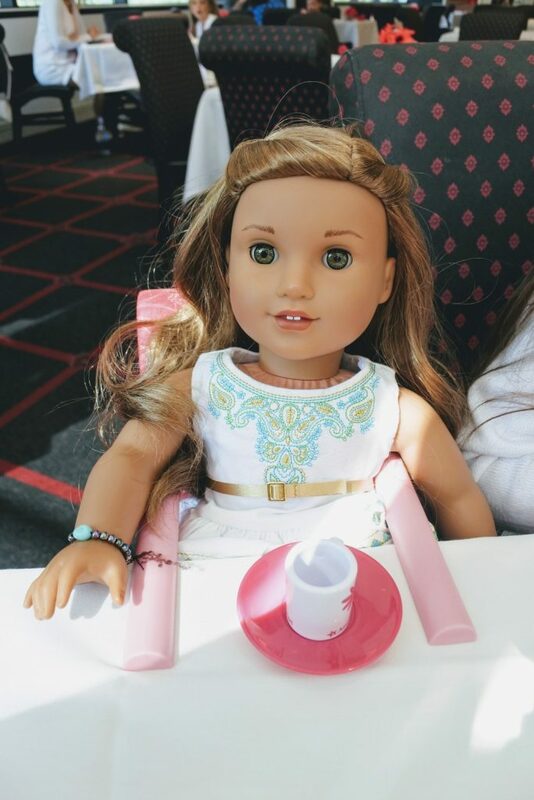 I hope this article gives you the confidence to celebrate a meal in style at American Girl! The staff will work with you every step of the way to ensure you have a great experience when dining at an American Girl Cafe or Bistro with or without a food allergy. This post was partially sponsored by American Girl Cafe. I was so happy with our first meal experience I asked for the opportunity to take pictures before the Cafe opened for the day, and they graciously provided a meal on the day I took photographs. All opinions are my own, from my own experiences. How nice you could find somewhere that handled the allergies correctly. I was surprised though that you often have trouble – it’s pretty much the norm in the UK now to have alternative menus. I’m glad they came through for you though. That is wonderful to know many places in the UK are good at accommodating food allergies. We are starting plan more trips abroad and I’ve been concerned. This is so reassuring to know it’s taken seriously and that they can come up with some great alternatives. It’s definitely a lot more common in the UK now so hopefully a spreading trend for you too. The meal sounds (and looks!) fantastic, and how great that they were able to take such great care of your daughter and her allergies. Dining out with food allergies can be so stressful, it’s great to have a few places in mind where you know that you will be taken care of. My daughter has always wanted to do this, but we don’t live near a store with a cafe. That is so great that they are so prepared for food allergies. I didn’t even know you could eat here! 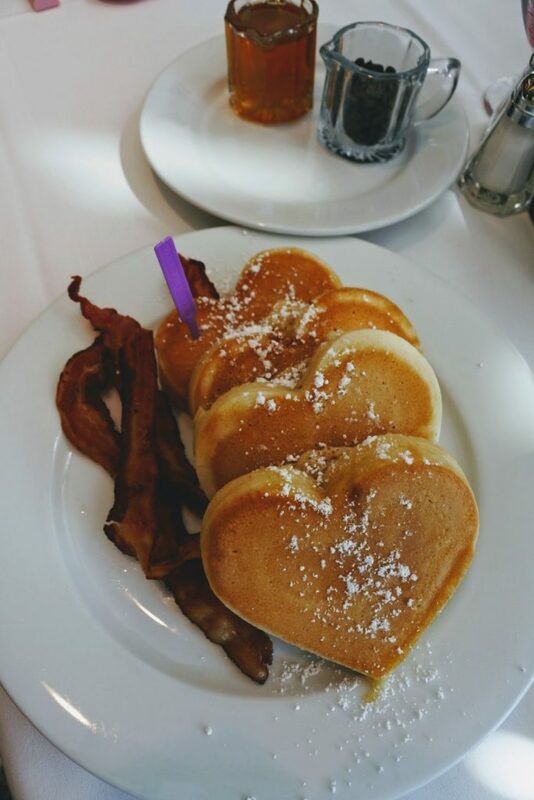 My daughter would love those heart shaped pancakes! What a wonderful way to celebrate a birthday! And how reassuring to know that American Girl take food allergies so seriously. On another note, I think this is a really lovely idea. My daughter is so not into dolls but I have friends with girls who LOVE them. Oh my goodness, this place sounds like every little girls dream. And the fact that they will lend you a doll to eat with you if you don’t have one is so sweet!